How often do we have a chance to touch a human brain? On October 19th, at Lewis Elementary School in Woodstock, students had that opportunity, at a new Lewis PTA sponsored event – "Sciencepalooza." The school's cafeteria was packed with students, parents, and guardians. The gathering encouraged participants to explore science together. Nonprofit organizations, science professionals, parent scientists, Lewis alumni, middle school students, high school and college students, and representatives of scientific governmental organizations had all been invited to present fun and informative hands-on exhibits to Lewis students of all grades. Human brains, robots, infrared technology, math games, earthquake engineering, slime, interactive exhibits on watershed restoration, environmental and veterinary science, and electricity were among the topics and activities that evening. Lewis parent Susan Rosenkranz was the organizer and coordinator of all of the participants. She described it as "a celebration of the sciences — an evening of curiosity, creativity, and critical thinking." The evening was also called a "STEAM" (Science, Technology, Engineering, Arts, and Math) night. The hands-on activities by professionals and students in STEAM fields included art, and opportunities for creative problem solving. The collaboration across art and STEM fields (Science, Technology, Engineering and Math) especially appealed to Rosencranz, who has a degree in both graphic arts and medical anthropology. "STEAM intertwines science and art. There is even a growing body of research documenting improved retention of content and long-term learning, when the arts are integrated into the classroom," explained Rosencranz. At the table for the nonprofit "NW Noggin", volunteers explained brain functions to the students. Aaron Eisen, a PSU student and NW Noggin volunteer, said that donated human brains are obtained from registered organ donors, and are incinerated unless they are used for teaching or research, so they take them along to exhibits. A few tables away were two Wilson High School juniors, whose "Loose Screws" robotic team had created a robot that made it to an international competition in Houston in April of this year. 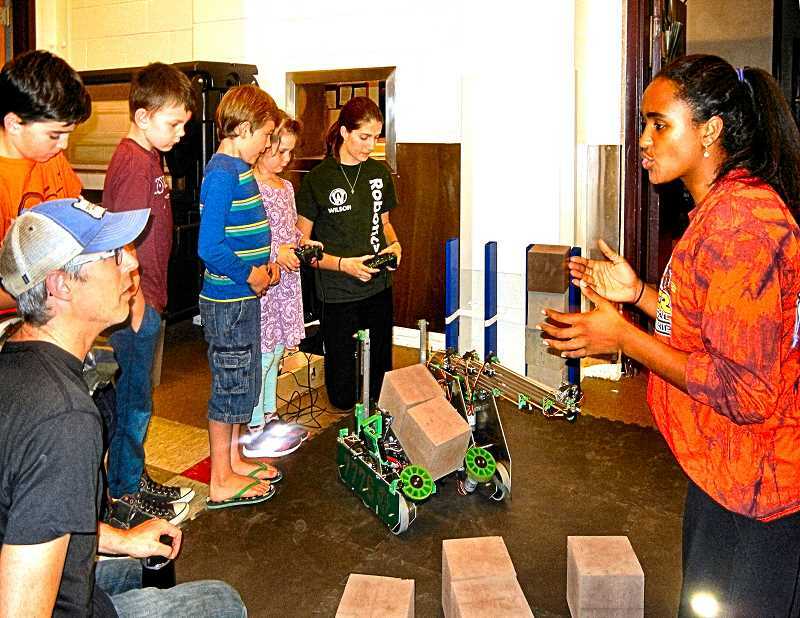 They were busy demonstrating the robot to students and parents. Rosencranz reported that every individual and organization that she asked to participate had responded positively. "We reached out to the local science community, and received an enthusiastic response. They were excited to share their passion for the sciences and creativity with our school." Rosencratz acknowledged Reed professor Presence O'Neal and Reed science students for their participation and their ongoing educational outreach to Lewis. She also thanked Wilson High School students, Sellwood Middle School, PSU students, the Johnson Creek Watershed Council, Oregon Health & Science University, NW Noggin, Saturday Academy, DEQ, and Metro for their exhibits. Rosencranz was grateful to the Lewis parents who collaborated with her on Sciencepalooza. In particular, she mentioned Anja Stadler, Janel and Dan Sabota, Mark Rosencranz, Matt Stevens, and Karen Doersam; and parents who had exhibits – Jessica Kleiss (Lewis & Clark professor of Environmental Studies), zoologist Tara Lilley, and engineer John Wolf. "I was thrilled with the turnout and the interest in science. Other scientists, and Lewis parents and students as well, have already expressed interest in getting involved and facilitating activity tables next year. "I'm thrilled by the positive feedback and desire to keep Sciencepalooza going. I can't wait to see what form it takes next year."